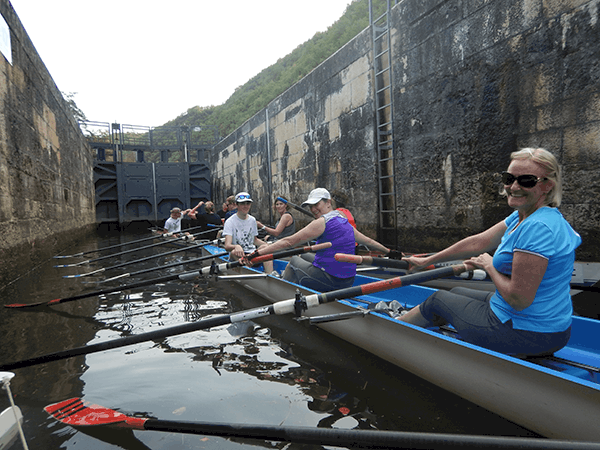 Our weekend rowing trips offer you a three day getaway with the chance to go somewhere different with virtually no time off work. Or use it to enhance a longer non-rowing vacation. Whatever your motivation, these trips give you an intense dose of your favourite sport in a beautiful location. Treat yourself, get away for a short break. France is a perennial favourite of travellers, so we are thrilled to offer this weekend in the southwest, a region famous for its food, wine and landscape as well as its beautiful rivers. Come by yourself and meet other rowers. Bring one of your rowing buddies to share the fun with. 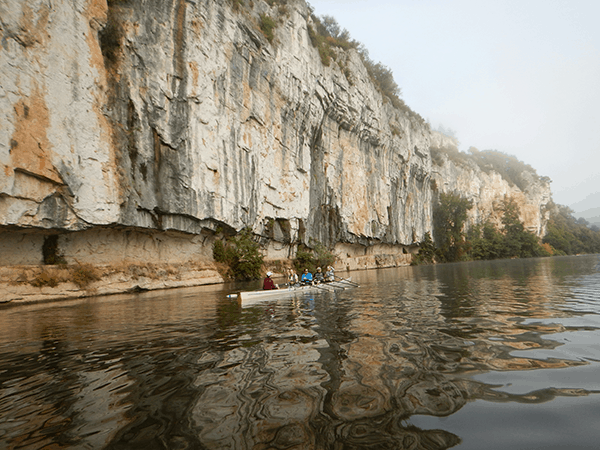 Together we will spend three days descending the Lot River, rowing through an ancient landscape of limestone cliffs, perched villages, walnut farms and vineyards. The Lot used to be used for transportation, and as with so many rivers, was supplanted by railways and roads. In the last few decades, navigation has returned to the rivers, with locks re-opened allowing us to explore one of the most beautiful rivers in France. We begin in the Parc Naturel Régional des Causses du Quercy. At times we will row through remote sections with just the green hills for company. Cave entrances can be glimpsed and you can imagine pre-historic hunters and gathers who populated this region and left mysterious painting of mammoths, antelopes and their hands, hidden deep in the rocks. We row past castles and villages perched high on dramatic cliffs. 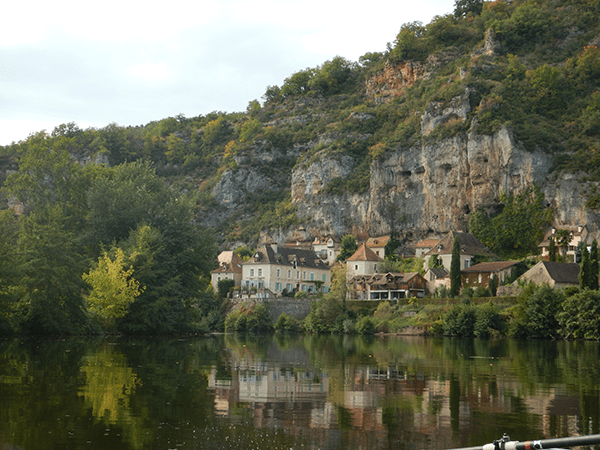 The most famous is Saint-Cirq-Lapopie, a stunning site best appreciated from the water. Walnut groves fill the few flat stretches before we reach the vineyards named for the city of Cahors. 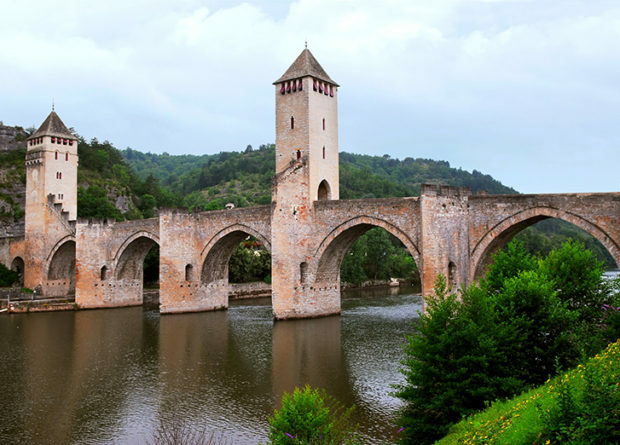 The spectacular Pont Valentré is over 700 years old and classified as a UNESCO world heritage site, just another of the many features packed into this weekend. In a country famous for its food and wine, the Southwest is particularly renowned. The hearty but refined food of duck confit or magret de canard, patés, walnut pastries and perhaps a little foie gras is perfect for our fall row. Cahors wine is deep red, with an intensity of flavour similar to Malbec. September is the perfect time for this row and cuisine. Morning mists will curl up from the water as the air temperatures begin to rise. In the evenings it is cool and crisp, and we will be ready to relax and enjoy the rewards of good company and excellent food and wine. Two nights’ accommodation in a camping group mobile home and cabin and two star hotel. 3 days/2 nights with three days of rowing. 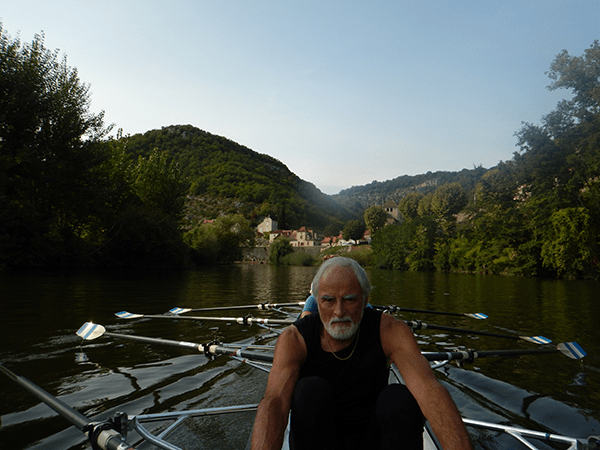 We meet in Cahors just after noon from where we will be transported up river to our starting location in Larnagol. 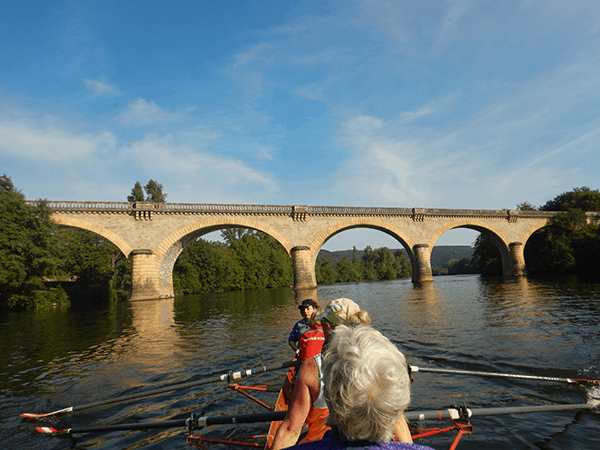 We’ll enjoy a lovely warm-up row of 13km including views of the charming Château de Cénévières. Tonight our accommodation is cabins in a four star camping by Saint-Cirq-Lapopie, where will enjoy our first taste of local cuisine over a hearty dinner. Today’s row is 35 km. We do half in the morning before a picnic lunch on the banks of the river. Then the same again in the afternoon to arrive in Cahors and a well-earned festive diner at the hotel restaurant. Two star-hotel accommodation. We continue our way down the Lot from Cahors, ending in the vineyards of Douelle after 15 km. We return for a final lunch at the hotel restaurant. Departure after lunch from Cahors.